B35 VP202 CX-B of 14 sqn RAF Wahn, West Germany 1948, in overall Painted Alluminium. PR34 RG245 DH-S of 540 sqn RAF Benson 1949, in overall PRU blue with non-standard underwing codes and very large squadron crest on tail. NF36 RK985 TW-G of 141 sqn RAF Church Fenton 1949, Medium Sea Grey overall with Dark green camouflage on upper surfaces. NF36 LR147 'E' of 85 sqn, RAF West Malling 1950, Medium Sea Grey overall with Dark green camouflage on upper surfaces. This was one of very few Mosquito squadrons to carry bars on fuselage roundels. 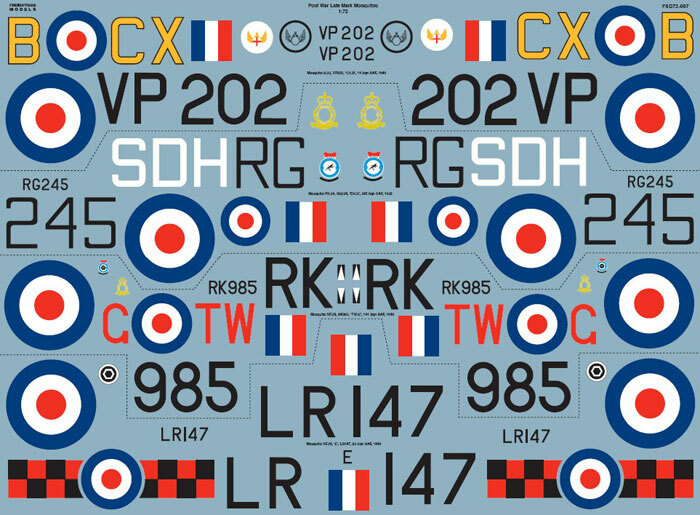 Decals are designed for use with respective Airfix and Tamiya kits with Paragon conversion parts as required. Some additional work will be needed to represent the clear nose and AI Mk X scanner for the NF36 versions, left unpainted in peacetime. Attached is the decal artwork, to be printed as usual by Fantasy Printshop in the United Kingdom. Two new stockists, Linden Hill in the USA and Southern Sky Models in Australia, are both now carrying the full range of Freightdog decals.